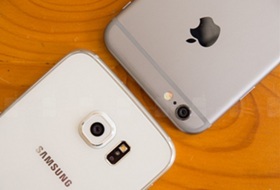 Apple and Samsung are two closest rivals. While Samsung doesn't hit the headline so often as Apple, it still presents ample competition. Though many users are still searching for iPhone 7 and Samsung Galaxy S7 differences, another battle between the two biggest flagship smartphones, iPhone 7 vs Galaxy S6 edge battle continues to be white-hot.Which will attract consumers' favor? How will Samsung Galaxy S6 stack up against iPhone 7/Plus/6SE which will receive the long-awaited makeover? Learn the post where we compare iPhone 7 and Samsung Galaxy S6 differences, pros and cons in battery life, display, camera and other specs in detail. Though Samsung Galaxy S7/S7 Edge will going to be a common topic, the choice now is still between iPhone 7 and Samsung Galaxy S6/S6 Edge. If you don't have a strong personal preference to Apple or Samsung, the choice between iPhone 7 or Galaxy S6, two smartphones both with advanced features, becomes harder. Does Apple prepare enough iPhone 7 pros to attract customers? So you will need to check the detailed Apple iPhone 7 vs Samsung S6 edge below. To have a slim design, Samsung Galaxy kills one of its welcome feature: the external Micro SD Card. Instead, it increases the starting internal storage from 32GB. Comparing iPhone 7 and Galaxy S6 in this respect, Samsung lost the long stand advantage. iPhone 7 also starts from 32GB, but it will goes up to 256GB, double the maximum internal storage 128GB in Galaxy S6. Besides, after updated to iOS 10, more available storage can be seen on iPhone 7 compared with its predecessors. The iOS 10 also features the ability to delete built-in apps, which will free up more space on iPhone 7/Plus. Check to see more iOS 10 update and iOS 11 update tips. Obviously, iPhone 7 is a great device to enjoy movies music. To make this easier, the cutting-edge MacX MediaTrans will be useful. This iPhone 7 manager, on one hand, will transfer music, mp3, HD videos, movies etc from computer Windows 10/macOS Sierra to iPhone 7 for enjoy on the go; one the other hand, can backup previous iPhone data to computer for upgrading to iPhone 7, and backup iPhone 7 media to computer to free up more storage on iPhone 7/Plus etc. Thus, you don't need worry how to move the downloaded movies to iPhone after you download movies to iPhone 7. Display stands as an important factor in Samsung Galaxy S6 vs iPhone 7 comparison. iPhone 7/Plus will come in 4.7-inch and 5.5-inch 3D Touch, with a Retina HD display of 1334 x 720 or 1920 x 1080 resolution. 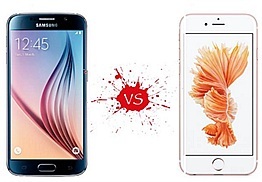 In this round of Samsung S6 vs iPhone 7 fight, Samsung S6 stays slightly inferior to iPhone 7/Plus. Samsung Galaxy S6 pairs with a 5.1-inch Super AMOLED capacitive touchscreen and resolution of 1440 x 2560 pixels (~577 ppi pixel density). Apparently, both Samsung Galaxy S6 and iPhone 7/Plus will handle with HD 1080p/720p videos with aplomb, but iPhone 7/Plus is more suitable for 4K UHD videos. Performance determines how smooth of the experience on each smartphone will be and thus is a key part of the iPhone 7 vs Samsung S6 comparison. iPhone 7/Plus will have A10 Fusion chip processor with 2GB of RAM on smaller 4.7-inch iPhone 7 and 3GB RAM on larger 5.5-inch iPhone 7 Plus. Given the extremely-fast performance on iPhone 6S with A9, A10 will deliver more power. Samsung Galaxy S6 comes with a 1.5GHz octa-core processor with 3G RAM configuration. The flagship phone is claimed to be the fastest smartphone. Admittedly, Galaxy S6 and iPhone 7/Plus perform really well, but it remains to be seen if Galaxy S6 is the fastest as Toms Guide found no discernible differences between Samsung Galaxy S6 and iPhone 6. That is to say, a much faster performance can be expected in iPhone 7 compared with Galaxy S6 edge. It is highly possible that iPhone 7/Plus will run iOS 10. If this is true, various enhanced functions and new features will be seen in iPhone 7/Plus, like Dark Mode, Siri API, default 3rd-party Apps and more. Same as all the new mobile OS, when it comes to update to iOS 10, you might encounter some bugs as before. Compared with iPhone 7, Samsung Galaxy S6 edge stays with Android OS, v5.0.2 (Lollipop), upgradable to v5.1.1 (Lollipop). Android Lollipop is a clean and good Android OS version. 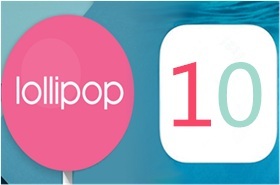 But as the latest Android 6.0 Marshmallow was rolled out last year, Samsung Galaxy S6 lags far behind iPhone 7's new iOS 10. Still, the decision between Samsung Galaxy S6 and iPhone 7/Plus comes down to your preference to Google's services or Apple's. Another major battleground of Apple iPhone 7 and Samsung Galaxy S6 is the ability to take pictures. 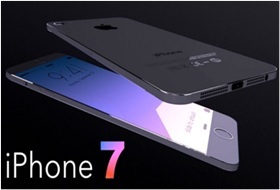 iPhone 7 will feature a 12MP rear and 7MP front camera. Besides, the iPhone 7 Plus offers a dual-camera system, 12MP wide-angle and telephoto cameras, which improved optical image stabilization (OIS) and 4k video recording. You can easily free up space on iPhone 7 to save those large-size HD/4K videos/pictures. Samsung always win in the megapixels department but this is not the case for Samsung Galaxy s6 vs iPhone 7/Plus. Samsung Galaxy S6, with 16-megapixel rear and 5-megapixel front camera, is among the best camera for photograph taking. Besides, it has various modes like stand auto, slow motion, fast motion. iPhone is always criticized for its terrible battery life and Apple decides to change the situation with improved battery life in iPhone 7/Plus. 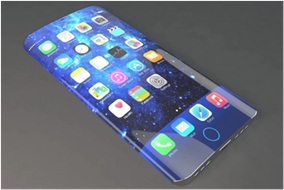 Apple iPhone 7 may feature a larger 3100 mAh battery, a marked increase from the iPhone 6s and 6s Plus models which come with 1715 mAh and 2750 mAh batteries. 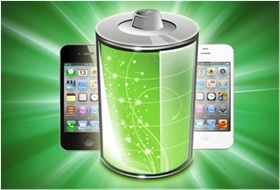 Users will no more need to rack their brains for battery saving tips. Besides, the A10 and iOS 10 will be helpful to extent the battery life. Galaxy S6's another big weakness comapred to the Apple iPhone 7 may lie in its battery. With Non-removable Li-Ion 2550 mAh battery, Galaxy S6 with up to 17 h (3G) talk time. For heavy users, the battery cannot last for a day between charges. MacX MediaTrans can help backup iPhone to Mac/PC (windows 10/macOS Sierra), covering photos, music, videos, movies, iTunes purchases, DRM contents etc and transfer to iPhone 7 in one click. Video 4K at 30fps, 1080p at 30 or 60fps 2160p@30fps, 1080p@60fps, 720p@120fps, HDR, dual-video rec. Read more to know the advantages and disadvantages of iPhone 7 before you go to the Apple Store for the new iPhone. MacX MediaTrans is an all-in-one media manager for iPhone iPad iPod with top quality and fast speed. This feature-rich transfer software can transfer music, pictures, HD or SD videos to iOS devices.